geckzilla wrote: That's the kind of thing I'm expecting from Tabby's star, eventually... just a very, very lucky alignment of an unusual disk. Another amazing image from ALMA. You think Tabby's star is young enough to still have a disk? Or it has a disk even if it isn't young? Probably not a full disk. Just something like the outer section, here, but probably even less organized. We've seen disks in incredible detail now, but finer detail exists still, I'm sure. As it stands, we see them as smooth and regular. Here is an example of a disk that is asymmetrical. It's hard to say if it's also bumpy, but it might be. A clumped, irregular, asymmetrical disk could cause bizarre drops in brightness if it just so happens to cross our line of sight. Searching for Tabby's Star comes up with some interesting images. This galaxy pair might actually be overlapping and not interacting? Last edited by starsurfer on Wed Oct 18, 2017 11:09 am, edited 1 time in total. 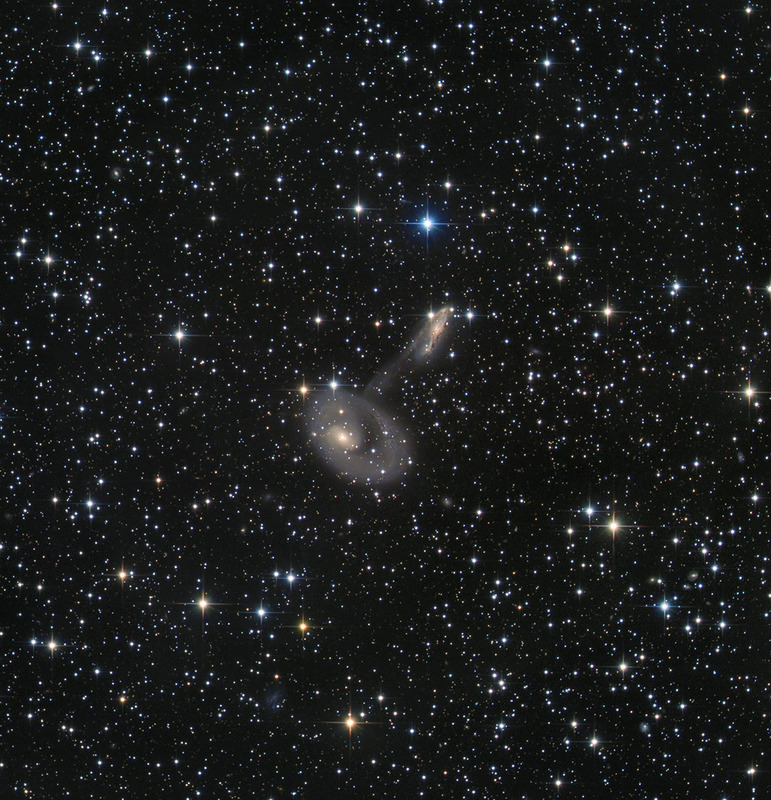 This interacting galaxy pair really does resemble a mushroom when viewed north up! Starsurfer, do you know the coordinates of this interacting pair? I haven't been able to find them. This NASA/ESA Hubble Space Telescope image is chock-full of galaxies — each glowing speck is a different galaxy, bar the bright flash in the middle of the image which is actually a star lying within our own galaxy that just happened to be in the way. At the centre of the image lies something especially interesting, the centre of the massive galaxy cluster called WHL J24.3324-8.477, including the brightest galaxy of the cluster. This infrared image was taken by Hubble’s Advanced Camera for Surveys and Wide-Field Camera 3 as part of an observing programme called RELICS (Reionization Lensing Cluster Survey). RELICS imaged 41 massive galaxy clusters with the aim of finding the brightest distant galaxies for the forthcoming NASA/ESA/CSA James Webb Space Telescope (JWST) to study. Such research will tell us more about our cosmic origins. Brilliant blue stars litter the southern sky and the galactic bulge of our home galaxy, the Milky Way, hangs serenely above the horizon in this spectacular shot of ESO’s Paranal Observatory. 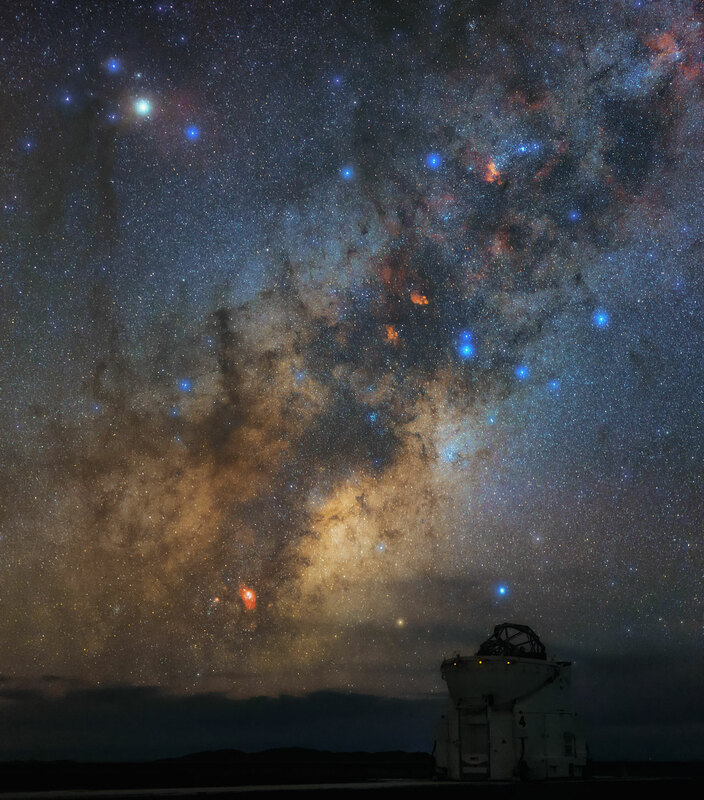 This image was taken atop Cerro Paranal in Chile, home to ESO’s Very Large Telescope (VLT). In the foreground, the open dome of one of the four 1.8-metre Auxiliary Telescopes can be seen. The four Auxiliary Telescopes can be utilised together, to form the Very Large Telescope Interferometer (VLTI). The plane of the Milky Way is dotted with bright regions of hot gas. The very bright star towards the upper left corner of the frame is Antares — the brightest star in Scorpius and the fifteenth brightest star in the night sky. The Universe contains some truly massive objects. Although we are still unsure how such gigantic things come to be, the current leading theory is known as hierarchical clustering, whereby small clumps of matter collide and merge to grow ever larger. The 14-billion-year history of the Universe has seen the formation of some enormous cosmic structures, including galaxy groups, clusters, and superclusters — the largest known structures in the cosmos! This particular cluster is called Abell 665. It was named after its discoverer, George O. Abell, who included it in his seminal 1958 cluster catalogue. Abell 665 is located in the well-known northern constellation of Ursa Major (The Great Bear). This incredible image combines visible and infrared light gathered by the NASA/ESA Hubble Space Telescope using two of its cameras: the Advanced Camera for Surveys and the Wide Field Camera 3. 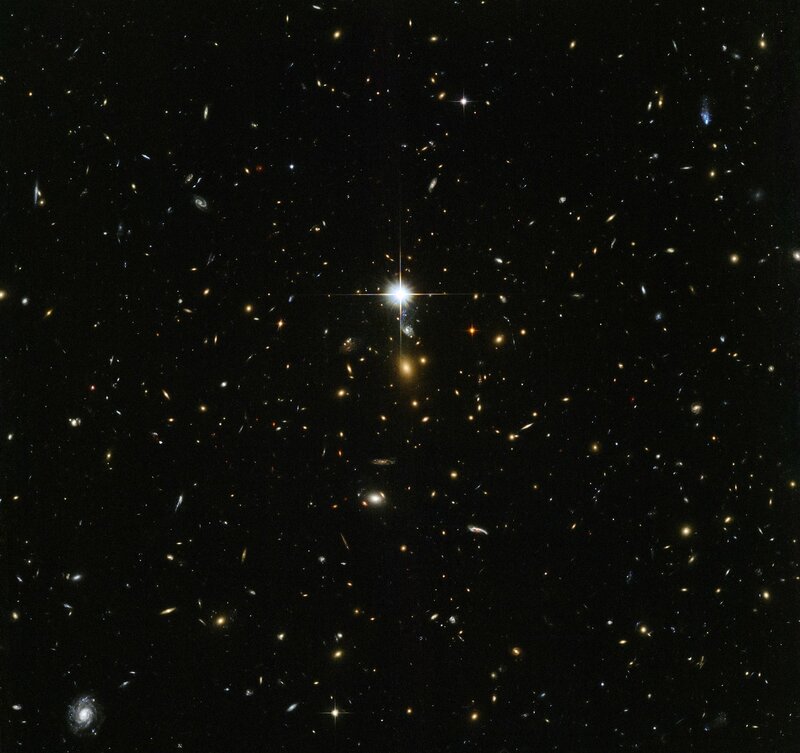 Abell 665 is the only galaxy cluster in Abell’s entire catalogue to be given a richness class of 5, indicating that the cluster contains at least 300 individual galaxies. 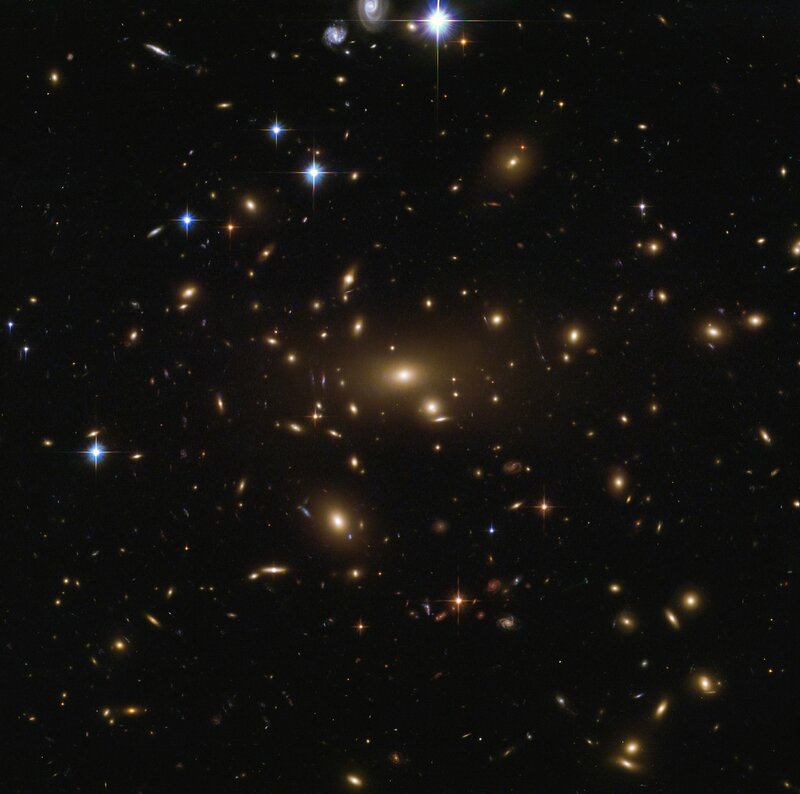 Because of this richness, the cluster has been studied extensively at all wavelengths, resulting in a number of fascinating discoveries — among other research, Abell 665 has been found to host a giant radio halo, powerful shockwaves, and has been used to calculate an updated value for the Hubble constant (a measure of how fast the Universe is expanding).